Seeks maximum long-term capital appreciation through investment in companies based in emerging markets. The Emerging Markets Fund invests, under normal circumstances, at least 80% of its net assets (plus the amount of borrowings, if any) in the securities of companies based in emerging markets. This includes securities of companies based in or whose securities are primarily traded on an emerging market exchange. It also includes those that have at least 50% of their assets in or derive at least 50% of their revenues from business activities in emerging market countries. The Fund generally invests in the stocks of small- and medium-sized companies with a market capitalization of less than $5 billion or within the range of companies in the MSCI Emerging Markets Small-Cap Index, whichever is greater. The companies selected for the Fund are typically untested and leveraged to the rapid expansion of the underlying region’s economy. Their above-average, long-term growth potential makes them most appealing for long-term investors who can tolerate the volatility associated with seeking maximum capital appreciation. Oberweis Asset Management, Inc. (OAM), the Fund’s investment advisor is contractually obligated through April 30, 2019 to reduce its management fees or reimburse OBEMX to the extent that total ordinary operating expenses exceed in any one year 1.75% expressed as a percentage of the Fund’s average daily net assets and for OIEMX 1.50%. 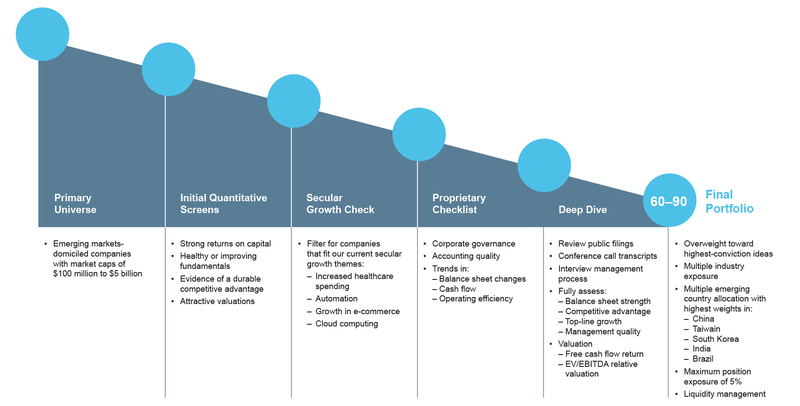 Our process rests on our firmwide commitment to uncovering and capitalizing on the persistent and recurring stock pricing inefficiencies in small-, mid-cap, and emerging-growth equities caused by a lag in investor response to new information. This lag in recognizing the catalysts likely to positively impact future earnings growth drives the security selection across all our strategies and mutual funds. The criteria used within each product, however, can differ. This is how our investment team implements our philosophy in the Emerging Markets fund. The MSCI Emerging Markets Small Cap Index is a free float-adjusted, market capitalization-weighted index that measures the performance of small-cap stocks in 24 emerging markets.